Do you have visions of your master bath being a personal spa, an escape from the hustle and bustle of the rest of the world? Many of us spend time preparing ourselves for the day and then unwinding and preparing for a restful night’s sleep in our bath. Shouldn’t it be a place of luxury and relaxation? A spa is a place to pamper yourself and leave the stress of the day behind to prevent it from following you to bed and disrupting your sleep. If you are dreaming of a bath remodel that will afford you a personal spa space, here are some must-haves to make the space as tranquil and comfortable as you deserve it to be. Many homes hide the natural light in a bathroom with a tiny window or behind glazed privacy windows. If you don’t have close neighbors and are graced with some privacy, we recommend making use of the windows and the view. Although we love the idea of wall-to-wall windows next to the tub, this isn’t always practical. With whatever window you have, install plane glass to allow natural light to spill in. Of course, you can install curtains or blinds in the event you’d like to shut the world out for a moment. Also, concider using an obscured glass choice if your view isn’t private or particularly spectacular. The addition of light will still brighten your room and your mood. Forget a tub, forget the walls and doors, open up your space and install a dual head European shower. We love the open feel of not being trapped in a shower or tub, but rather walking into a luxurious, cleansing rainshower. The dual shower heads allow you to move about or share the shower with a partner and continue to be showered without spinning around. Although, if you want to dance, we wouldn’t blame you. 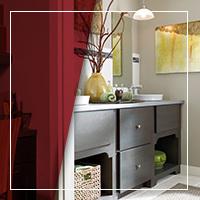 You cannot think about a bathroom remodel or upgrade without discussing storage. Many minimalist bathrooms have turned to reducing under the sink cabinets for alternative storage spaces. While this may leave more perceived floor space, we think there is great value in cabinets. If you love the look of a floating sink, custom in-wall cabinets can hold all of your bathroom accessories. Consider concealed pull out shelves, mirrored cabinets, and recessed wall cabinets to meet all of your storage needs without crowding your zen. Home baths have been known for using ceramic tile because it is easy to clean and looks great. However, when you think of a comfortable spa, cold feet do not come to mind. Install heated flooring. This is a small luxury that you will thank yourself for again and again. Seating in the bath is often overlooked because most people don’t associate the bathroom with a relaxing place to sit. It is a place of business, get ready and get on with it. However, in any luxury bath, there is a place for you to sit and collect yourself — to have a moment of blissful peace and take a load off. Whether you prefer an oversized chair or a simple dressing bench, offering yourself a place to sit and relax will instantly make your personal spa more inviting. The bath is not a place to overdo it on accessorizing. However, simple, tasteful accessories are a necessary component to any spa. We recommend a few candles in a soothing, relaxing scent. If you have a tub, placing a few around the tub can help you drift into relaxation that much quicker. If you don’t like candles, you can leave bath salts or petals in open-topped glass jars to achieve the same response. If you decide that you need a tub, be sure to indulge in one that is soak-worthy. Standard tubs are meant for getting clean — more business than comfort. We recommend a large, jet garden tub (to set in front of your wall-to-wall window) or a Japanese soaking tub. Any tub that is comfortable and large enough that you won’t have to choose to soak your kees or your shoulders will add a spa-like quality to your bath. The bath is where you spend your time preparing to take on the world and unwinding from the stress of taking on the world. It should be a place to reward and pamper yourself, for a job well done. If you are considering a bath remodel, consider the finished product to be a luxurious personal spa. 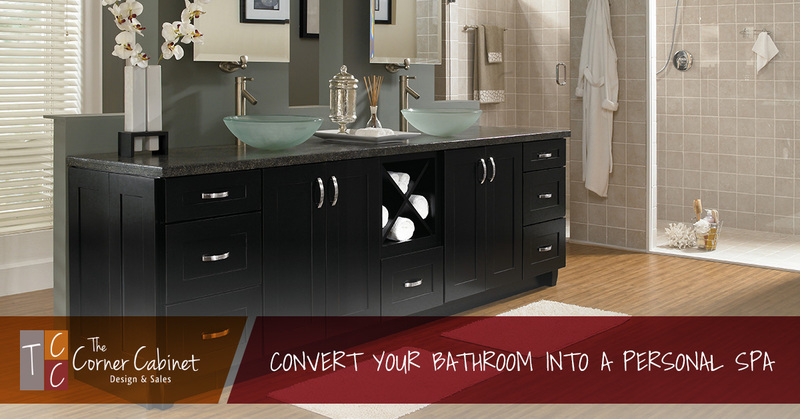 At The Corner Cabinets, we have decades of experience in designing the perfect luxury bath. Contact us or stop by our showroom today!